What’s your story? Tell us about yourself! My name is Chelsea Watkins and I am a Canadian from Vancouver, British Columbia – the most beautiful place in the world! I met my husband, Josh, six years ago at a church conference in another province and we eventually got married. We love volunteering with youth at our local church, relax by playing video games together, go for walks along the seawall, or find the next best brunch spot in the city. After being married for a couple of years we decided to pack up and move to be closer to Josh’s family (Family is important and I hated that I only saw Josh’s family at Christmas or random visits!). 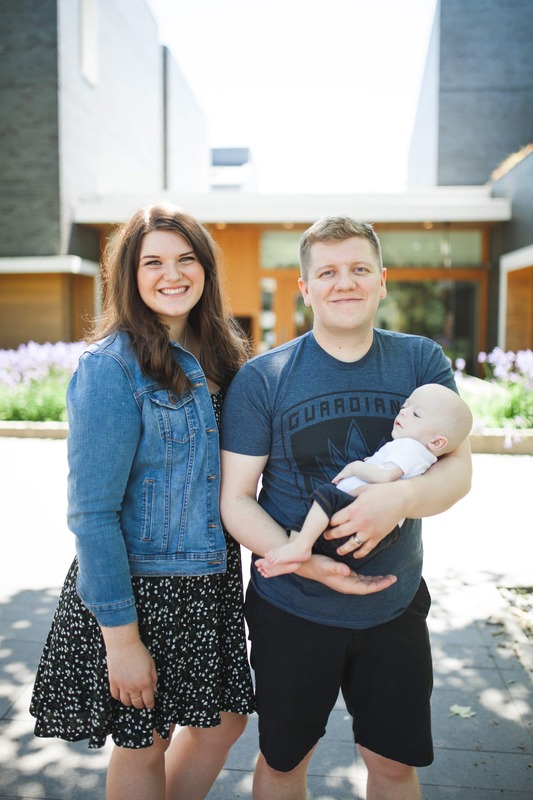 After a few months of living in a small town in Manitoba, we got pregnant! We were so excited! We immediately started dreaming of life as a family and all of the adventures and “first-times” we would have with our new little baby. Would our baby boy grow up to be a doctor? Would he make that funny face the first time he tries a lemon wedge? Would he be tall and play point guard in basketball?! We couldn’t be more excited and our minds kept dreaming of the what-ifs! I had a very healthy pregnancy and took every precaution to make sure I didn’t break any of the “rules” of what you shouldn’t do when pregnant. Josh’s cousins were getting married in another province when I was 21 weeks pregnant and we did the big drive to be apart of their special day. But once I got there I started having the strangest pains! Having never been pregnant before, I had no idea that the sharp pains were in fact contractions. The pains got worse throughout the weekend to the point that I would wake up multiple times at night in extreme pain. After the wedding, we left to start our long drive ba ck home, with me in the back seat sitting in every position to get comfortable! Despite me insisting that I was fine, Josh took me to the emergency that night. After a long wait in emergency, I finally got examined and the doctor saw two little legs that were already on their way down the birthing canal. He immediately got me into an ambulance and I was sent to the main hospital in Winnipeg. I ended up being on bedrest for just over a week and then had our son, Zion, at about twenty-four weeks gestation via emergency c-section in August 2016. Not exactly the way the birth story I had imagined! Zion spent the next five and a half months in the NICU and we moved into the Ronald McDonald House in Winnipeg so we could be a few short blocks away from him. Since Zion has been home we have moved back to Vancouver, have been admitted another three times, and have now spent a total of two hundred and twenty days (and counting!) at the hospital, including tonight as I write this! His team expects another surgery or two within the year so we know this isn’t the end of our hospital stays for the year. Tell us about Zion… What was the birth and first year of life like for you and him? Does he have a diagnosis? 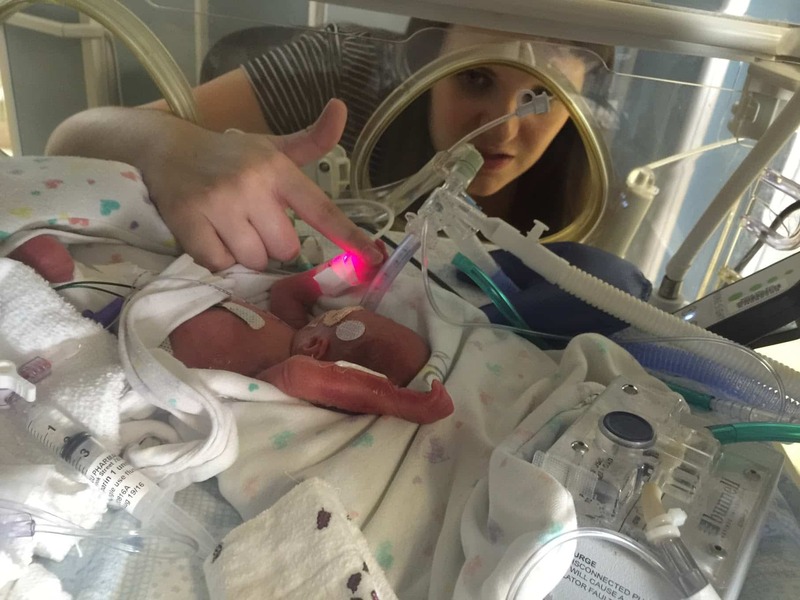 Zion was 1.3lb when he was born at 24+1 weeks (a normal pregnancy is 40 weeks). The months after that were spent sitting beside Zion’s little NICU isolette, learning new medical jargon, living in a small room at the Ronald McDonald House down the road and experiencing all of the ups and downs that come with having a medically complex baby. Zion now has scars up and down his body from central lines (including a botched line insertion where they thought they would have to amputate his leg! ), countless IV’s, his heels are tough from continuous pokes, he’s got the cutest little glasses which came after being treated for ROP (Retinopathy of Prematurity) by eye injections and laser treatments, and he has large scars on his tummy from an ileostomy, gut surgery and now a colostomy. Zion was classified as “failure to thrive” as he was unable to absorb his nutrition, even though we were feeding him on a strict every 2hr schedule around the clock. He was severely under the 1% on every growth curve and we knew something had to change. We ended up moving from Winnipeg to Vancouver, to be closer to my family and to also work with a team at the hospital here that specializes in kids with complex nutrition. They were able to set us up with home TPN, give us guidelines for feeding and recently set us up for surgery to put back the ileostomy and create a more long-term colostomy. Zion has been on home TPN for seven months now and has completely caught up and past his growth curve, shocking all of his specialists! He also has an adrenal insufficiency since birth with his cortisol levels. This means that we give him daily steroid medications, stress doses when he’s sick or in surgery and have learnt how to give emergency injections if things get ugly. 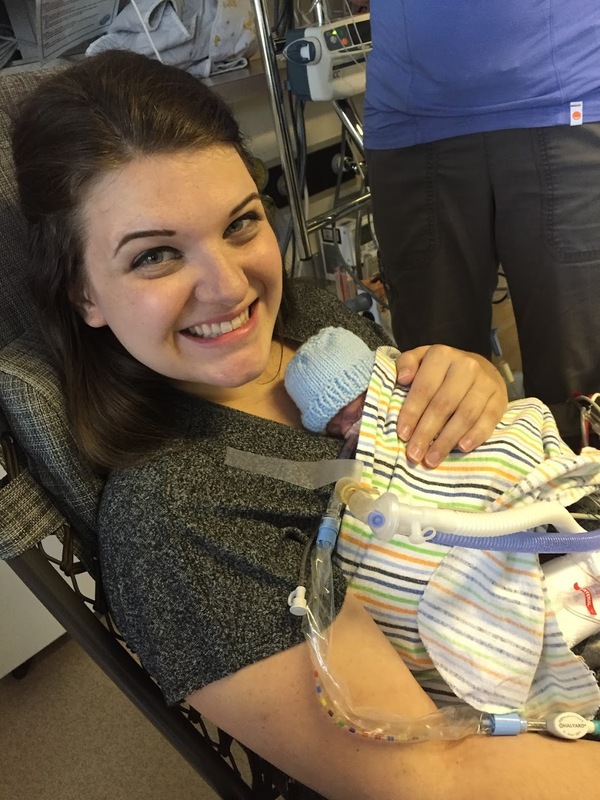 Zion has had many diagnoses over his lifetime, especially in the NICU. Some of them include: failure to thrive, ROP (Retinopathy of Prematurity), hyperglycemia, hypotension, adrenal insufficient, bowel perforation from NEC (Necrotizing Enterocolitis), loop ileostomy (which has recently been put back), colostomy, short bowel syndrome, bronchopulmonary dysplasia, inability to control body heat, jaundice, and sepsis. How has your mindset changed with having a child who has medical complications? Are there things you are aware of and sensitive to now that you have experienced his 1.5 years of life partly a hospital? I feel like I was naive to families who have medically complex kids. I always have been genuinely sympathetic, but now I think I have an empathy to both parents and children who have medical complications. When I see a family, I want to run up to them and give them a hug and say that I’m right there with them. It’s a terrible thing to feel alone in your fight for health. I am more sensitive to different things around me since spending seven months (and counting!) in the hospital with Zion. I’m very aware of those who are sick and I make mental notes of those who say they haven’t had their flu shots or immunizations. I find myself praising companies or buildings that have good wheelchair accessibility. My mind has been opened to a world of organizations and groups that help support special needs families. And I’ve definitely found myself feeling like parents and friends around me can’t quite relate to my way of parenting – “why again can’t you travel?”, “why won’t you let us visit?” and “I could NEVER do what you do.” I’m thankful to have so many friends who support us and are so understanding, but it can be hard once you realize that you don’t share those normal experiences that other parents do. My milestones are different than other people’s… Instead of: ‘Wow, my son started walking already!’, I’m just happy my son can breathe on his own for the first time. Do you have time right now to practice self-care or is your life too hectic for that right now? If so, what do you do to help your body and mind recenter/reset? I find that when things are really intense with Zion and touch and go, the first thing for me to forget about is self-care. All of my energy goes into focusing on the more important things, like keeping my kid alive. In those stressful days, my way of self-care would be just to remember to eat in a day! Thankfully we are in a season now that has more routine and self-care can start to be more a part of my routine. I’ve learnt the hard way that I can’t take care of others if I don’t first take care of myself. You can only run on fumes for so long! To help my body and mind recenter I like to wake up before everyone else, have a cup of tea and read/journal about what’s going on. For me, it’s a great way to focus before the craziness of the day starts. I also like to go for a run when I feel overwhelmed, avoid junk food and sugars (even though fast food is dangerously convenient, especially on those insane days! ), purposefully drink lots of water and look to find a special moment with Josh and Zion each day. Why do you think the mission of Springible is so important? I love Springible’s mission! I think most groups focus on the obvious needs within a medically complex family and tend to overlook the caregiver who often times is going through their own hard (and usually silent) journey. What a beautiful thing to offer not only support but to also say ‘hey, you’re not alone’. As a new member to the caregiver community, I am so thankful for resources like Springible that can help me navigate through these rough, unknown waters. It’s nice to be able to relate to others when you’re used to feeling like the odd person out in your regular circles. What is something you’ve learned on this short journey as a caregiver that you could offer to someone else who is JUST NOW stepping into this journey for the first time? I’ve learnt to expect the unexpected. Nothing is ever certain. I use to think, “Once this issue is done, THEN things will feel normal and we can do this activity/photo/party” but our medical journey has been much longer than I ever would have anticipated. It’s important to pause in the middle of it all and choose to enjoy the little moments. You will never get that exact moment again. Whether you’re in the hospital or on a strict schedule at home or living life to the fullest, just enjoy today. Take pictures. Laugh. Put on that outfit you were saving for the “perfect moment”! Today is beautiful and one day you will look back and be grateful that you didn’t let the worries of the moment overshadow all of the good around you.